I just got back from a bear hunt where absolutely everything went wrong. Between getting eaten alive by mosquitoes the first evening (seriously, it was bad), and the moon being so obnoxiously bright that I couldn't sleep, it was already off to a rough start. Add to that the fact that I hiked and glassed multiple drainages, stared at countless prickly pear cacti brimming with perfectly ripe fruit that hordes of bears SHOULD be eating, and yet turned up absolutely zero wildlife. It was actually eerie...every other step I was walking through old elk, deer, antelope, and even some bear sign, but I never encountered a single fresh piece of evidence that any other living creature was currently in this part of the wilderness. It was as if aliens had come a year before and abducted every four-legged creature in this canyon, leaving only their dried and sun-baked poo as a reminder that they once roamed the landscape. So after an evening and long morning of frustratingly fruitless glassing, I decided to hop in the ol' Jeep and drive a couple miles the other direction to check a series of tanks I could see on my map. Precisely 1/2 mile from camp, I came up out of a significant rut in the road, heard a familiar clank, and immediately began hearing metal scraping and grinding against itself. I had been here before just a couple years prior...I had broken the shackle on my right-rear leaf spring. The rig could be driven and I knew I could limp it back home on a paved road, but it was going to be a bad idea to keep thrashing it on this pretty gnarly road that had broken it in the first place. I was dead in the water...or, land, I suppose. I thought through all the options, and realized that I could leave my Jeep right there on the side of that road the rest of the hunt and hike out of basecamp to the same series of drainages that had so far proven to contain zero bears, or I could get myself back to town, hopefully find the part, play parking lot mechanic, then relocate to a different portion of that same unit that perhaps would actually hold bears. I knew that was the smart play, but had one giant obstacle in front of me: my entire camp was 1/2 mile away, and it would have really been a bad idea to try and drive back there on that broken suspension (as I was fortunate to break down just a couple hundred yards from the main highway). My only option: bring camp to the Jeep. Four grueling and awkward trips later, I had the Jeep all packed up again with everything I had brought into the woods. Side-Note: if you ever have to carry a full size cooler 1/2 mile by yourself for some reason, the best method is to tie whatever rope you have around it, loop the other end over yourself, and drag that beast out of there like a pack mule. The bottom of your cooler won't look pretty, but your back will thank you. Yes, it's a redneck solution to the cooler problem, but those are often extremely effective! Sadly, I got into town, stopped at the nearest parts store, called all others within a 50 mile radius, and absolutely no one had quick access to that part. Slowly, I accepted the awful truth: my hunt was over a full 48 hours earlier than I had planned. Was it a failure? Did I just waste a couple days and endure a huge headache to chase bears that weren't even there? Obviously, we'd all love to eliminate areas that don't hold our targeted game from the comfort of our couch using Google Earth, but that isn't always possible. More than that, anyone who has done a fair amount of e-scouting will tell you that an area can look like an absolutely textbook habitat for a particular animal from the air, and end up being a total dud on the ground (as was the case with my bear hunt). I would love to have seen some bear activity in these drainages, but now I can direct my attention to other points of interest I have marked in other parts of the unit. Bear season in AZ opens up again in October, and I am taking a buddy on his first big game hunt then. At least now I won't waste a day or two of our time hanging out in that area saying, "I don't get it...they should be here." Though it's always discouraging to take a scouting or hunting trip and not see what you're looking for, I find adopting the perspective of an explorer helps soften the blow a little bit. You're out in nature (which I think we'll all agree is always a good decision), in many cases you are setting foot on ground you've never covered before - you're taking in sights and vantages you've only seen from satellite imagery, and you're adding to your mental notepad of what this area/unit/state holds. It may be blind optimism, but I actually like knowing I can turn my attention to the next spot that might hold my game and not keep wondering what might be at that first spot...it's one less "what if" floating out there. Plus, I just like covering country and knowing what's out there. There are few things as satisfying as exploring brand new country. I realize that sounds all flowery and stuff, but any outdoorsman will tell you there is something incredible that happens within us when we get out into the wild. We may use different verbiage to describe it, and we may attribute it to different physical or spiritual sources, but getting away from the daily grind and unplugging a bit is never a bad idea. Every time I come back from the wilderness (even if the hunt itself was a total disaster) I find myself more at peace. I am a better husband, father and man when I have been in the woods. If you have to tell yourself that you weren't actually hunting but just taking a long hike to make it feel more successful, then do that. But, don't lose sight of the fact that it is a gift to be out in nature, whether the physical outcome was what you hoped for or not. There is only so much you can learn about your gear in your living room. It can be great to pack everything up, re-organize, throw weight in your pack and walk around the neighborhood...but until you actually start using that gear in the wild, you never know exactly how it's going to work out for you. Even when you aren't seeing game, you are testing most of your gear in the process. On this bear hunt, I picked up at least two things I didn't realize about my standard hunting gear. First, I was keeping my food for the day in a stupid pocket on my pack. I realized half way through it made much more sense (and would keep my dry goods from getting as crushed) if I used what was a very under-utilized pocket for that purpose, and shifted some camera gear into the former food receptacle. Second, I discovered that if I find a glassing spot that requires me to stand, my tripod is about three inches too short. That doesn't sound like a lot, but after an hour of slightly squatting/crouching to use your binos, you would give anything to be able to just stand up perfectly straight. These seem like two very minor things, but I've had both those pieces of gear for a couple years now, and this is the first time I've discovered these flaws in my setup. If the mosquitoes weren't killing me by this point, that hunched over position certainly was...time to buy a taller tripod! Whatever your gear situation and however dialed-in you feel it may be, there will always be room for improvement. 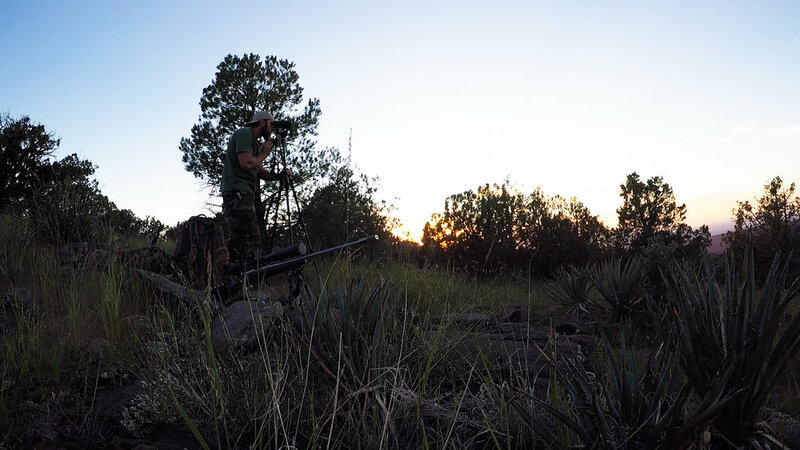 Even if it isn't an objective improvement, we change over time, our hunting styles adapt, and we keep finding new or more efficient ways to manage our gear. A hunt spent finding no animals is a great opportunity to play around with some different gear options, and you may even discover some sort of life-hack that pays off for years to come. Personally, I think that's worth a disappointing weekend of hunting. So there you have it! Call it looking on the bright side or outright delusion, but I firmly believe there is always value in being in the field. Even if all you walk away with are a few lessons, some beautiful scenery, and a broken truck, you still walk away a more experienced hunter.